Joint project leader Terry Neal … working on the timeline. A detailed plan of the SLENZ Project’s activities over the next few months, based on the variables influencing the second half of the project, has been put together by joint project leader Terry Neal (SL: Tere Tinkel). In keeping with the project’s “communications policy” the plan, developed in face-to-face workshop discussion, has been posted (as a spreadsheet) on the SLENZ blog by joint project leader Dr Clare Atkins (SL: Arwenna Stardust). The plan had been developed with “a much clearer idea of all the variables involved in the second part of the project,” Atkins said. With only Neal and Atkins having editing rights it is to be updated and republished whenever a change is made so that it will always reflect the current information on the project. The easiest way to find it is to click on the Project Development TImeline page link on the left of the blog posting or go directly to the page . A two-day workshop in Wellington has firmed up the SLENZ Project timeline, sorted niggling build problems and priorities, as well as signaling the end of communication problems which appeared to be hindering the early stages of the project. With stage 1 of the midwifery pilot to begin operation under the direction of lead educator Sarah Stewart (SL: Petal Stransky) mid-June and stage 2 mid-July, on-campus tutor/student orientation is due to begin in May. The tutors from the polytechnics involved in the Foundation Learning pilot led by Merle Lemon will begin orientation with a face-to-face meeting in July in preparation for a September/October launch. Both groups, however, plan to hold a number of “spontaneous” in-world meetings with-in their separate pilot groups in the lead-up to the formal orientation process and tutor training. These meetings will also allow them to experience, in an “avatar hands-on” fashion, the structures/animations created by (and under the supervision) of lead developer Aaron Griffiths (SL: Isa Goodman) and provide grassroots feedback where necessary. On the communication front it was noted that joint project leader Dr Clare Atkins’ (SL: Arwenna Stardust) resolution of team’s communications into the SLENZ Project Development googledocs – as the official working and final documents – with direct access from the SLENZ Update blog had obviated much of the confusion which has surrounded the previous proliferation of semi-official communication channels. Atkins stressed again the value of each and every member using the googledocs system to update group thinking. Cochrane also briefed team members on SLOODLE/MOODLE as a useful on-going in-world resource and tool for educators. The team agreed that as the Project was publicly-funded every effort should be made to ensure all documents were open to the public and/or under Creative Commons License and that all items commissioned and built for project should be “full perms”. It was noted that the “basic builds” with full functionality and full perms, once completed, would be available from a “vendor” for free public usage. Besides her meeting room build on Kowhai Lemon is investigating using holodecks for specific interviewing scenarios such as, Police recruiting interviews, hospitality industry recruiting interviews, nursing and teacher interviews. She plans to use roleplay as part of her tutor training as well. There also was some discussion of the team’s direction once the project has been completed and evaluated by year end. The final meeting of the SLENZ Project Team is planned for August/September with evaluation of the project planned for October/November. Business meetings: a lesson for teachers? 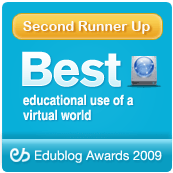 The experience gained from doing business and holding business meetings in Second Life are sometimes denigrated by academics as not being applicable to the education or learning situation. However, the recently published IBM case study demonstrated that internal meetings work well within Second Life while the work of Trade Promotion Management Associates (TPMA) has shown that even “complete newbies” from around the world and a variety of enterprises can have a worthwhile experience on a first time visit to Second Life, if that visit is properly managed. Amanda Linden, after noting in her Linden blog that the technical, cultural, and usability challenges faced by the TPMA “brownbag event” had the potential to wreck the 160-avatar/participant Second Life conference last month, said it went off without a hitch due largely to the work of Grondstedt Group, TPMA’s in-world partner. The key to the success? Proper orientation and training. Grondstedt, Amanda Linden said, had led all participants – from manufacturing, retail, and industry analyst firms – through a 30-minute training session and all speakers and exhibitors through a 60-minute training session to ensure that when the conference day arrived, everyone was ready to walk, talk, text chat, and participate in this new virtual event experience. Her three-question interview with Diane M. Berry (pictured), the CEO of TPMA, detailed just how valuable The Gronstedt Group’s technical experience and know-how, MUVE training, Second Life beach-themed island ownership and building skills had been. The Gronstedt Group, Berry said, had removed all of the technically challenging aspects even though on the non-technical side there was still a lack of knowledge and awareness of Second L ifewhich created a “bit of a hurdle for speakers and sponsors. She added, however, that the TPMA meeting had been more productive than any virtual conference that the Vendor Compliance Federation and TPMA had attended or run, including webinars, because “it is such an immersive experience; attendees have the responsibility of responding to their avatar’s surroundings, including other individuals, so there is some “social pressure” to pay attention. According to Virtual World News, Gronstedt estimated the industry savings from the free event to be more than US$200,000, made up through the elimation of hotel costs, flights, and other expenses. There also was a considerable time saving involved, despite the need for training. The 200 plus IBM participants were offered pre-conference training on the basics of Second Life to make them comfortable communicating and navigating within the environment. IBM estimated the ROI for the Virtual World Conference was roughly US$320,000 and that the Annual Meeting was executed at one-fifth the cost of a real world event. “IBM has been making a significant investment in VWs now for two years. …. it’s time to take it from research to reality, ” Karen Keeter, an IBM marketing executive, said. Clever Zebra was the first company to hold a large-scale public business event in Second Life and to date is the only group to have successfully run a “tri-reality” event together with IBM and Cornell University. Are you prepared to have all of your guests logged out of your event, and dumped into a public “welcome area” when they try to log back in? This actually happened to us during a seminar we were giving to paying clients. Needless to say it was not the best experience for anyone. What are you going to do if logins are disabled while engineers try to fix the problem that’s caused all of your guests to be logged out? What if they can’t login for an hour or two, will they come back and participate hours after your scheduled start time? Will your speakers (students/teachers?) busy schedules allow them to hang around waiting for normal service to resume? How will such a disruption reflect on your organisation? Is telling your guests (students/teachers) it’s not your fault good enough? How will such disruption affect the future of your virtual events (classroom?) project? How will it affect your career? Although directed at business these also are all worthwhile questions for the academic teacher/facilitator. You possibly ignore them at your peril. March 27-29, 2009 in Second Life. Following considerable SLED list debate on the “future” of the SL education conference – especially, apparently, from those MUVE “believers” who who want a “real life” gabfest experiences that one travels to – Pathfinder Linden has posted an interesting interview with Kevin Feenan (pictured, SL: Phelan Corrimal ), the general chair of the conference, which will be held entirely in Second Life, rather than having a real life base. Taking its lead from a number of previous successful conferences – the Second Life Best Practices in Education Conference in May 2007, the SLCC07 in Chicago, and the SLEDcc in Tampa in 2008 – the SLEBPE has been revived under the banner of Virtual Worlds because of the increase in virtual worlds which successfully cater for education, such as OpenSim, IMVU, Club Penguin, WoW, Wonderland, Entropia etc . For all those who complain about the “closed world, commercial” nature of Second Life – and there are a number – Feenan has a message. He sees the future of the conference being “dictated by the way the educational community uses virtual collaborative environments”. “In the short term, definitely a heavy focus on Second Life,” he said. ” However, as avatars are increasingly able to teleport between virtual worlds I see the conference following those changes and perhaps expanding to bridge knowledge gaps that may develop as other virtual communities get established. And to bring back to this environment (SL) solutions that may not be so evident here because we don’t have to overcome the same challenges to get something to work.” For free registration: http://www.vwbpe.org. Stanford University plans to launch Sirikata, a BSD licensed open source platform for virtual worlds, in alpha release soon. The team behind the project which is being done in conjunction with Intel’s Cable Beach Project aims to provide a set of libraries and protocols which can be used to deploy a virtual world, as well as fully featured sample implementations of services for hosting and deploying these worlds. The video-teaser for the project is fascinating, and shows just where OpenSim technology is going. It appears to show a compelling, easy-to-use virtual world with realistic avatars and movement. For techies the lengthy discussion about Intel’s efforts in the open virtual world space and getting outside the “walled garden” scenario between Intel’s John Hurliman, Stanford’s Ewen Cheslack-Postava, Daniel Horn and Henrik Bennetsen provides an interesting background to the project. . Besides disclosing that Intel is currently working on connectors for all VW worlds, the conversation ranged from the technical approach to the work and ended with more general comments. But at 51 minutes it is long and could have done with considerable editing.. There is another video in which Cheslack-Postava and Horn give a briefing on Sirikata which, for techies, also is worthwhile. Meanwhile Nick Wilson (pictured), over at Clever Zebra, has predicted that open source rather than interoperability will drive the masses to virtual worlds. He lists the top three technologies researchers/educators/businesses should be investigating right now as OpenSim, Wonderland and Open Croquet, with Solipsis and Sirikata waiting in the wings. Clever Zebra HQ orientation…. how one team does it. I’ve been an admirer of Caleb Booker for sometime. I religiously read his blog, Caleb Booker – Business in Virtual Worlds (http://www.calebbooker.com/blog/ ). I also follow the activities and the publications of Clever Zebra (http://cleverzebra.com/). In a blog published in mid February Booker (pictured), in real life Chief Operations Officer at Clever Zebra. surpassed himself. For the SLENZ Project his timing could probably not be better. We are currently looking closely at Orientation. Asking the question “Does it matter how we bring people into Virtual Worlds?” he looks at the best and some of the worst Orientation options devised by Second Life experts and looks at the different designs of Orientation for varied users and interests. The piece, ROI in Virtual Worlds – The New User Experience (http://www.calebbooker.com/blog/2009/02/10/roi-in-virtual-worlds-the-new-user-experience/ ) , part of his ROI in Virtual World series (http://www.calebbooker.com/blog/roi-in-virtual-worlds/ ), to my mind has inestimable value and should be read by everyone contemplating setting up an Orientation experience whether for teachers or students, businessmen and women or romantics and adventurers. To my mind too many institutions who are new (and sometimes not so new) to Second Life attempt to reinvent the “wheel” rather than improving what has gone before. Booker at least gives them a definitive view of where most of the the old “wheels” are, why some work and why some don’t. The Booker blog is a good starting point for a happy life in Second Life.